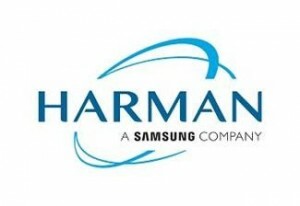 STAMFORD, CT – November 8, 2018 – HARMAN International, a wholly-owned subsidiary of Samsung Electronics Co. Ltd., focused on connected technologies for automotive, consumer and enterprise markets, today announced that the company has opened a new office facility in Łódź, Poland to accommodate its growing talent in the country. MUNICH, Germany – HARMAN International, a wholly-owned subsidiary of Samsung Electronics Co., Ltd. focused on connected technologies for automotive, consumer and enterprise markets, today announced the opening of its first Experience Store in Europe. Located at Sendlinger Straße 46, in the heart of Munich’s popular central retail shopping district, the new location is designed to serve as a showcase for HARMAN’s award-winning audio solutions across all consumer and automotive categories. It highlights how the company’s heritage of craftsmanship merges with innovation and cutting edge technology in both the store design and the products on display. “Our first HARMAN store in Europe transcends simple retail to a memorable visual and auditory experience centre. It is a dynamic showcase for our family of brands including JBL, Harman Kardon and AKG, and it will feature select cars from our automaker partners that include our in-dash technologies and sound systems. The store will truly be a place where speed meets sound, combining our automotive audio and consumer audio heritage in one place. Through it, we will continue to transform how consumers interact with our audio products and brands,” said Michael Mauser, President, Lifestyle Audio at HARMAN. “HARMAN is a house of world-renowned audio brands, and this new space is in many ways a manifestation of that house. Flagship stores tell our story and enable us to take centre stage to connect directly with consumers. This is an important step in the development and growth of our brands across Europe and we are delighted to welcome consumers to our Munich Experience Store,” said Ralph Santana, Chief Marketing Officer at HARMAN. The space is designed to be entirely transformed for various events including lectures, small concerts, parties, etc. – fixtures can be moved, digital displays can be taken over, colour-changing LEDs in the ceiling can wash the space in colours to adapt to every need and mood. It will feature award-winning consumer products from JBL, Harman Kardon and AKG including headphones, portable speakers, soundbars, voice controlled speakers and much more. HARMAN’s automotive audio business will also feature in the store with a rotating selection of vehicles equipped with state-of-the-art sound systems from its portfolio of automotive audio brands including Harman Kardon, JBL, Bang & Olufsen, Bowers & Wilkins. Pushing the experiential dimension even further, the Munich Experience Store will enable customers to interact not only with HARMAN’s products, but also with regular musical events, celebrity appearances and car launches in collaboration with automakers, amongst the activities. An additional Luxury Audio Studio is also set to open in an adjacent space later this year. In the Luxury Audio Studio, audio enthusiasts will be able to enjoy and explore products from HARMAN’s exclusive luxury brands like Lexicon, Mark Levinson, and Revel plus it will include a deluxe cinema featuring Dolby Atmos. The first of its kind in Europe, the Experience Store in Munich is intended to bring together speed and sound in a unique way. Across a 33.5-metre glass façade lies a modern, dynamic environment that pays homage to Germany’s rich automotive culture and legendary precision. Gensler Architects, whose portfolio includes Facebook’s California headquarters, Cadillac House in New York, and the stunning Shanghai Tower, designed the interior as the visualisation of a sound wave that guides consumers from the front to the back of the store, offering a cadenced retail experience that revolves around the visualisation and emotion of a sound wave articulated through both form and light. Since opening its first flagship store in Shanghai in 2010, HARMAN has added such cosmopolitan locations as Tokyo and New York City. With its deep automotive roots, Munich was a natural choice for the first European Experience Store. The very design of the store’s interior evokes Germany’s powerful automotive culture and identity. As part of the opening, HARMAN will also make a commitment to the local community. Every holiday season, a portion of the proceeds will be donated to Munich-based youth athletic organisations. To kick off the campaign, HARMAN donated 25,000 EUR to the International Hockey Federation on the occasion of the store opening. The donation was handed over to German National Team Coach Marco Sturm and some key players from the silver-medal winning German Olympic championship team during an evening ceremony at the store. The Munich flagship store is open to the public starting 26 September and every Monday through Saturday from 10:00 a.m. to 7:00 p.m.
Industry veteran John Absmeier has been appointed Senior Vice President of the new HARMAN SBU, and will also retain his current role as Vice President of Smart Machines for SSIC. As a leader in both organisations, John Absmeier will ensure seamless collaboration to bring Autonomous and ADAS solutions to the market. STAMFORD, CT August 8th, 2017 – HARMAN International, a wholly-owned subsidiary of Samsung Electronics Co., Ltd. focused on connected technologies for automotive, consumer and enterprise markets announced it is teaming up with Google to provide music lovers with a free three-month subscription trial of the popular Google Play Music. Google Play Music delivers the right music for any moment by offering a smarter, easier to use, and much more assistive experience. With a subscription, Google Play Music gives listeners more than 40 million songs for any mood or situation on-demand and ad-free. Google Play Music suggests the right music for you based on the time of day, your preferences, location, activities, mood and more. Plus you can bring up to 50,000 tracks from your personal collection to Google Play Music’s locker. HARMAN provides the industry’s most complete end-to-end connected car system to provide drivers with intelligent, adaptable and personal solutions in the car. 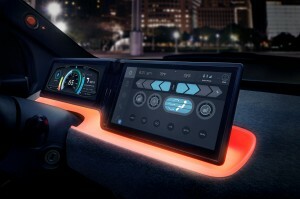 With more than 2,000 patents in all key domains – including safety, design, navigation, connectivity, networking, HMI and more – HARMAN continues to push the boundaries bringing connected car innovations to market that enable new connected experiences, improve driver safety and increase vehicle security. CES – LAS VEGAS– January 4, 2017 – HARMAN International (NYSE: HAR), the premier connected technologies company for automotive, consumer and enterprise markets, today announced a suite of solutions that make the autonomous driving experience intelligent, safe and intuitive. A series of distinct modes reinvent the in-vehicle user experience by reflecting consumer lifestyle and humanising the autonomous car. HARMAN’s end-to-end system will be debuted in the newest Rinspeed concept car, Oasis, at CES 2017. Leveraging the HARMAN LIVS suite of technologies (Life-Enhancing Intelligent Vehicle Solution), the Oasis offers a glimpse at the future of autonomous driving and how advanced, holistic vehicle intelligence will transform the driving experience. 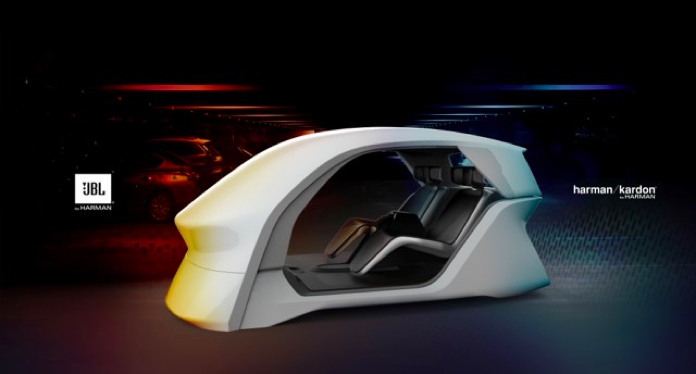 Recognising the many user modes enabled through autonomous vehicles – from work and play, to car sharing and social connectivity – HARMAN engineers have partnered across the industry to enable an intelligent, adaptable and personal suite of solutions in the concept car. Full Windshield Heads-Up Display: Oasis utilises the full windshield to project navigation prompts and other information to the driver, while also simultaneously projecting entertainment or information to the passenger. Autonomous Drive Readiness Check – Handover to Manual: One of the most critical concerns of autonomous vehicles is how to ensure the transition between autonomous mode and manual mode is handled seamlessly. HARMAN’s solution combines haptic feedback, eye gaze tracking, and the driver’s cognitive load readiness through pupil monitoring, to ensure that that the driver is truly engaged and able to safely take control of the steering wheel. Augmented Reality Concierge: This solution addresses the need to support increased productivity in the car while minimising distraction. A voice-controlled virtual assistant functions as a concierge, automatically suggesting and displaying personalised points of interest while enabling advanced in-vehicle productivity to join conference calls, update calendars and more. Through Skype connectivity, the system can even translate telephone conversations – in real time — with colleagues speaking different languages. Predictive Collision Prevention: V2X (vehicle-to-vehicle and vehicle-to-infrastructure) technologies detect objects on a collision course and offer corrective action.